Most of Thomas Nast's 1872 campaign cartoons were attacks on Horace Greeley and the Liberal-Republicans and Democrats, rather than positive portrayals of President Grant and the regular Republicans; but there are some examples of the latter. 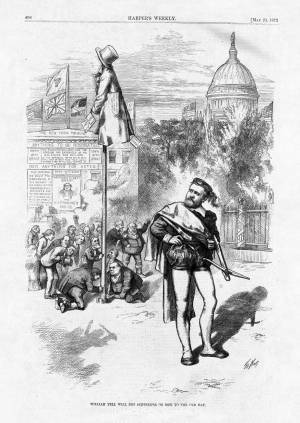 This cartoon is one of the more fanciful celebrations of hero worship, in which Ulysses Grant is depicted as the legendary Swiss archer and patriot William Tell. Behind him (on the right) are symbols of the authority of the national government: the Capitol building flanked by American flags and fasces (see "Adding Insult to Injury") on the fence enclosing the grounds.